Pink Tourmaline Gemstone is derived from a boron silicate that is combined with numerous metals, making it one of the most complex crystal structures. Pink Tourmaline Gemstone has been praised for its enigmatic properties throughout history, including its ability to get electrically charged upon being heated or rubbed – a property that was used in ancient times to draw ash out of smoking pipes. So far colour is concerned, it is found in pale pink to deep red. Some stones have flawless transparent texture while some have the opaque one. The origin of the word ‘Tourmaline’ comes from the land of Sri Lanka. It is derived from turamali (in the ancient Sinhalese language) which means ‘an earthly valuable of combined colours’; a precious stone of mix colours. Since the stone constitutes a combined strength of aluminum borosilicate’s mixed with iron and magnesium in varied degrees, it comes in different colours such ash pink, red, yellow, green, blue, even black and violet. When heated or rubbed, it gets charged up electrically, with one end positive and the other negative. The Dutch traders of the 17th centuries used Tourmaline to clean their Meerschaum pipes by pulling the ash from it because the stone (with its ability to get electrically charged) could attract dust particles. American mineralogist George Frederick Kunz discovered and sold a green Tourmaline stone to Tiffany and Co. based in New York. 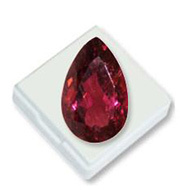 This led to the popularity of Tourmaline gemstones. In Chakra science, Pink Tourmaline is connected with Hrit Padma Chakra located two fingers below the heart. It is the place one’s Self / Atma. In its subtle form, it is a lotus with eight, six or thousand petals with the circular regions of sun, moon and fire in the center where the person’s Ishta god resides. An Ishta god is a divine part of the Absolute Transcendence that supplies the person with cosmic energies, during meditation. This gemstone has long been known for providing a field of prosperity to its wearer. Pink Tourmaline Gemstone is considered a good source of androgynous (male/female) energy. O It has a soothing effect on the heart, regulates the irregular heartbeat and causes speedy recovery from cardiac related issues. O It cools down the nervous system, neuralgia and migraines. O It simulates joy, peace and relaxation. O It influences the body's central channel and is associated with feelings of love, abundance and happiness. O When worn as jewellery (studded within rings, bracelets, pendants etc. ), it would protect the wearer from heart related issues and improve the mind's creativity and optimism towards life. O Its electrical nature has also been thought to protect the wearer from common electromagnetic radiation that arises from every day technology. O It is the best substitute for diamond. Wearing a combination of Gemstone and Rudraksha is the best way to make the most of it. 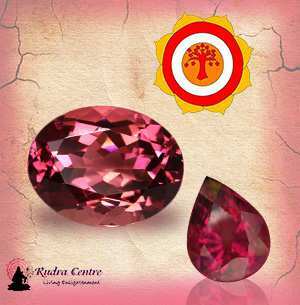 Rudraksha Ratna Science Therapy® (RRST®) devised by Neeta Singhal employs the use of both Pink Tourmaline gems and Rudraksha beads. It is a holistic healing therapy that uses the curative and healing properties of Rudraksha and Gemstones to balance your chakras. 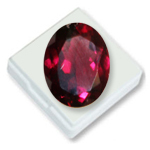 In RRST we deal only with natural and non-treated gemstones. The reason Rudraksha Ratna Science Therapy is widely acclaimed by many is that it works on chakras, the very basis of life, and is a holistic therapy that heals from deep within with absolutely no side effects. In RRST setting of a gemstone in form of a ring or pendent, the bhasm made of the planetary herb is kept inside one tube and a metal that improves the planetary effects is kept in the other tube. In case of Pink Tourmaline, Audumbara Bhasm and metal Platinum are used to attract the cosmic power of Venus. The gemstone is then energized with its precise seed mantra on a specific day to empower it to eliminate all the malefic effects of the planet and reinforce its beneficial effects. Thus the gemstone becomes a powerful talisman suitable to be worn by any person irrespective of his birth chart. During consultation, the blocked chakras that are causing the mental, emotional and physical issues are identified and limiting beliefs are addressed. Chakras become imbalanced when your thoughts and attitudes tend towards fears and negativity when facing challenging situations in life. Blocked Chakras manifest emotional disorders and physical ailments. It is only after blocked Chakras are balanced and activated that you can transform your life of suffering, obstacles, and confusions into love, success, and happiness. As per the chakra status and concerns of the client, a suitable combination of Gemstone and Rudraksha bead is recommended. 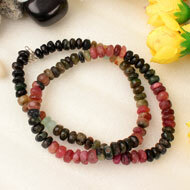 As per the cosmic colour they emit, the gemstones work on specific chakras. So Pink Tourmaline works on Hrit Padma Chakra and the RRST Consultant identifies the correct finger position for drawing maximum energy from the stone. Rudraksha and Gems are powerful agents of energy and work on releasing the negative energy stored in the form of stress in the blocked chakras, thereby activating them and tuning them to their natural state. Hrit Padma is another name for the Supreme Self or Atman. It is the essential and ultimate nature, the ineffable dimension of our being. It is the Witness Consciousness which intimates us of all our thoughts, emotions and sensations. Witness to both the mind and the universe in its inner and outer dimensions, the Hrit Padma Chakra, governs life lessons involving love and compassion. It signifies the sweetness of life and emphasizes the need to lead life unconditionally, with love and compassion. It signifies self-worth and self-acceptance and teaches one to be selfless and generous.When imbalanced / blocked you become egoist, harsh, frigid, selfish and self-cantered. You feel lonely and lack love for self as well as for others. When open and balanced this chakra denotes the sweetness of life. It makes a person lead a life full of unconditional love and bliss without any controls or restrictions. Love flows towards every creation of God including self, unconditionally and with lots of compassion. There is a healthy level of self-worth and self-acceptance. This person also desires a spiritual experience in love and affection. Hence proper functioning of all the chakras ensures appropriate energy flow to all body parts including our vital organs. Thus chakra cleansing and balancing is essential to enjoy good health and happiness which translates to overall abundance and wellbeing in every spheres of life. Your Pink Tourmaline might routinely carry negative energies, and the stone or ring can be detoxified by dipping it in saline water overnight. It is to be worn on Friday in the morning after bath. If need be, one may additionally chant the seed mantra “HOOM” 108 times before wearing. O A person Pink having spinal problems or injuries, the nervous system, neuralgia and migraines may wear this stone. O Those haunted by the depressing feelings, memories or emotions may wear this stone. O Anyone seeking to open their Hrit Padma Chakra may wear a Pink Tourmaline.